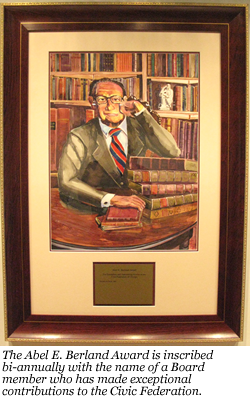 The Abel E. Berland Award for Exemplary and Outstanding Service to the Civic Federation was established in 2009 to honor Mr. Berland’s extraordinary service to the Federation and to recognize members of the Civic Federation Board of Directors for their own exceptional contributions. Abel E. Berland was a thirty-plus year member of the Civic Federation Board of Directors and a past Chairman of the Board. Mr. Berland was an internationally recognized bibliophile and collector of rare manuscripts. He was a distinguished real estate executive and was President of Arthur Rubloff & Co. for many years. It is thanks to Mr. Berland that his friend, Arthur Rubloff, included a very generous endowment of the Civic Federation in his bequests. That endowment has enabled the Civic Federation to continue its valuable work uninterrupted through good economic times and bad.